Who is ready to talk FACEBOOK PAGE INTERAAAAAACTION? 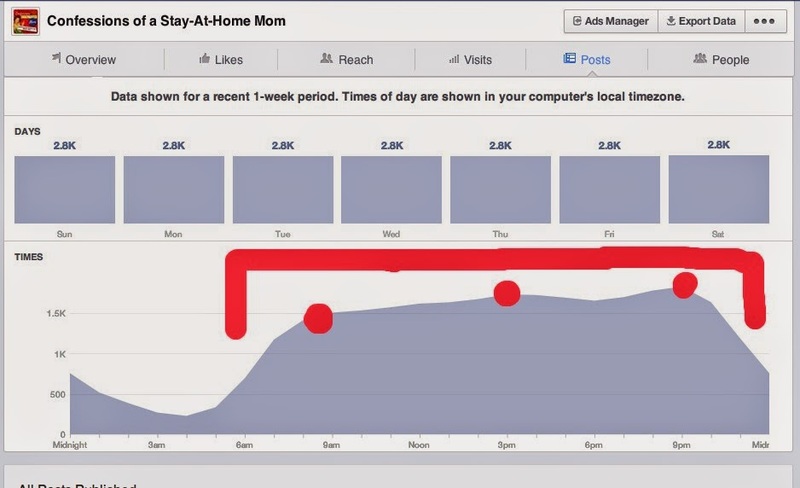 Yesterday, I introduced the intro post to this series on Increasing Facebook Interaction. There are a lot of community managers, social media consultants, brand marketers and bloggers who have become more and more frustrated by Facebook Pages. The algorithm is always changing, statistics are seemingly on the decline, and now they want money for priority in news feeds. It's like life as we know it is falling apart. I've found some things that have worked for me on several of the pages I manage, including the CSHM FB Page. I might keel over from laughing at any notion that I am an expert on the subject (it's actually a sacrilegious idea in several countries). But in this series I am up for sharing what has worked for me and what I would coach any other Facebook Page manager to try before totally calling it quits. So let's get to it already. 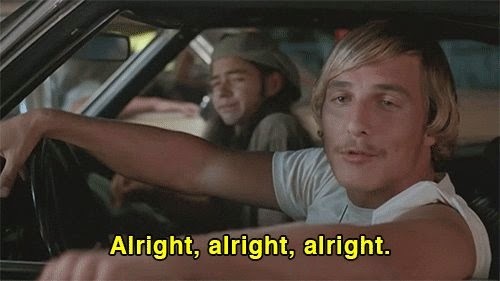 Alright alright alright? I'm going to start us at the beginning, where I would if anyone were to come to me and lament their Facebook Page decline. I'm going to ask you four questions, and I'd like to you to answer honestly. This is a good thing to write down: in notebook, on a doc in google drive, etc. Let this be part of forming a media strategy for your Facebook Page. 1) How many times per week do you post? 3) At what times during the day do you post/how do you space out your posts? 4) What kind of content do you post? Most page managers, in my experience, would answer the first two questions with "several times a week" or "once or twice a day." When I ask why, they usually respond that they don't want to be spammy or annoy people by popping up in their newsfeeds. You aren't popping up in people's newsfeeds. Even before the increase in boosted posts and changes in algorithms, there was still an element of relevancy in how Facebook chose what to put in people's newsfeeds. The more a person interacted with a page, the more weight it would give the algorithm to have it placed in their newsfeed (and even then, it sometimes still didn't pop up). So, if you are only posting a few times a week, you are losing ground fast in terms of being seen. Let's pretend that Facebook did post a majority of your content in your fan's newsfeeds, and you posted, say, once a day at 10am. While many people check in on Facebook a few times a day, there are only a small percentage that would be on at 10am (or slightly before/after) to catch that post. Think about how much of your audience only checks Facebook before and after work (8am and 6pm). 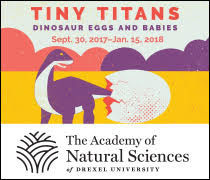 Or only during lunch break or naptimes (11am, 12pm or 2pm). Or can only focus on Facebook after the kids are in bed (8pm). You are missing all of those people, people! Think of how you use Facebook. You don't scroll back to the beginning of the day to see what you missed (and, even that is only what Facebook chooses you to see). No, you may scroll back a little, but you'll check what's immediately happening. So you want to catch people as they are on. Even though it goes against everything we media-types know as being "spammy" it actually works in our favor to post several times a day, all week long. Don't worry: even if your fans saw, say, 4 posts from you each day, it is interspersed with the gagillion other posts in their newsfeed. I encourage managers to post several times per day (my magic number is 4, but that's just what I do on the business pages I run. I usually post more often than that on CSHM), spaced throughout the day. No one wants 3 posts back-to-back in their newsfeed from you. Then you are spammy. Rather, pick a morning time, an afternoon time, a later afternoon/early evening time and a night time. I often recommend something along the lines of 9am, 12pm, 3pm and 7pm. This way, you are hitting different members of your audience as well as spaced out enough that you aren't considered spammy to your fans. Once there, click on "Posts"
Then take note of two things: DAYS and TIMES. You'll see in my current insights, that each day is equally responsive. I don't have one day that is better to post than another. Some pages may find that one or two days perform better. If you have days that perform better, DEFINITELY use those days. Next, you'll see there is a graph showing when I get the most visits/responses from my posts. Mine always takes the shape of a whale (the fin on the left shows people heading to bed around midnight and sleeping until the whale's body begins as people wake up and start checking Facebook around 6am). For this particular page, it's most beneficial for me to post between the hours of 6am and midnight, with peaks (as highlighted by the dots above) around 9am, 3pm and 9pm. I'm learning more that I have some "night owl" action (i.e. : an audience after 8pm) and I am starting to use it more with posts and questions at 8 or 9 o'clock. LEARN from your insights. And work with them! If you have a crazy spike because you have an audience who sees/interacts with your posts at 6am then WORK THAT, GIRLFRIEND. While posting frequently is about the day-to-day, posting consistently is about the long haul: week-to-week, month-to-month. This is where the patience comes in, friends. You have to give it time. If you post regularly for 3 days straight then fall off the face of the earth for a week or two, you can't expect to see results. I tell people you need to give it a month of consistency. Partly, for your fans/audience to get used to expecting to hear from you, expecting to respond to you. Partly because Facebook needs time to learn how people are responding to your page and adjust how it places content in newsfeeds accordingly. Partly, for you to make posting a habit. 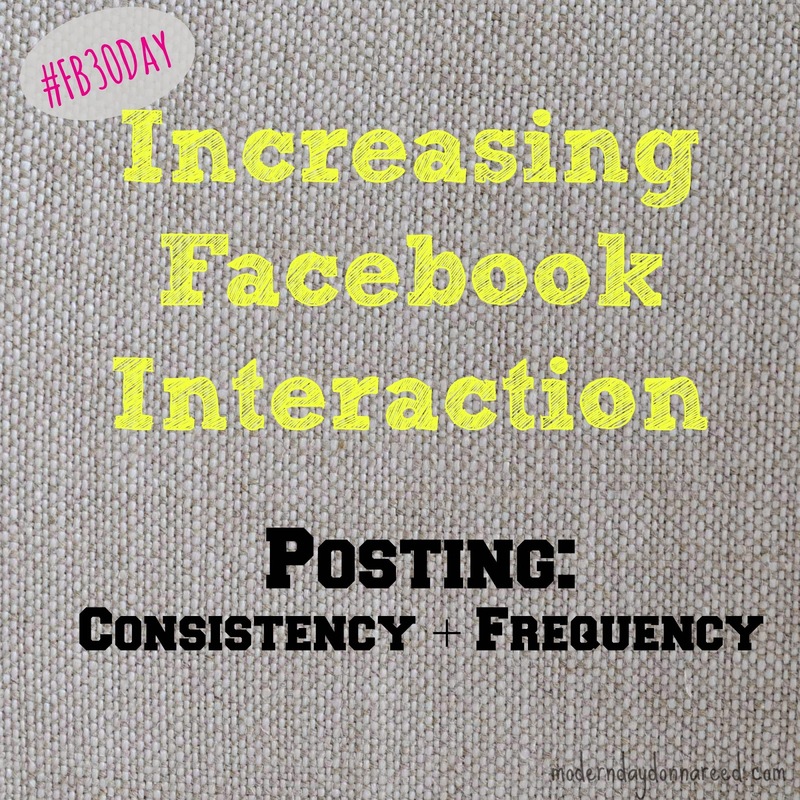 As you make your Facebook Page Strategy, I encourage you to commit to implementing frequency and consistency for 30 days. Warning: You may or may not see results during this time. What you are doing, though, is creating a habit for both you and your fans, as well as laying the ground work for experimentation and tweaking. After the ground work 30 days, take another 30-90 to try different things to see what works for your audience (this will come in the next post about content). Are you ready to start posting more? Are you ready to commit to doing that for at least 30 days? We'll get more into what you'll be posting in my next post. In the meantime, spend time studying your insights and determining what days and times work best for you. Consider what kind of time investment you'd like to make in terms of how often you'll be posting per day (don't forget the lovely scheduling feature! I'd perish without it!). Start writing the TIMING framework of your strategy. Don't be afraid to post regularly, people! How often do you want to commit to posting each day? According to your insights, what days and times do posts perform best? Leave a comment and let's talk strategy! And feel free to leave any questions (or email me/tweet me/message me on FB). I'm totes happy to talk you through your particular situation.